The amfAR Gala New York serves as the unofficial kick-off to New York Fashion Week, which officially begins on Thursday, and honors individuals who have made outstanding contributions to the fight against HIV/AIDS. Several of our favorite celebrities made sure to attend this black-tie event that features cocktails, a seated dinner, a live auction of luxury items, and musical performances. The American singer-songwriter ended up showing more than she’d bargained for in a strapless black dress from the Georges Hobeika Spring 2018 Collection featuring a slit that exposed her pelvis. While we won’t show you pictures of her black underwear, we’ll keep the focus on her towering Jimmy Choo ‘Max’ platform sandals (available at Farfetch). 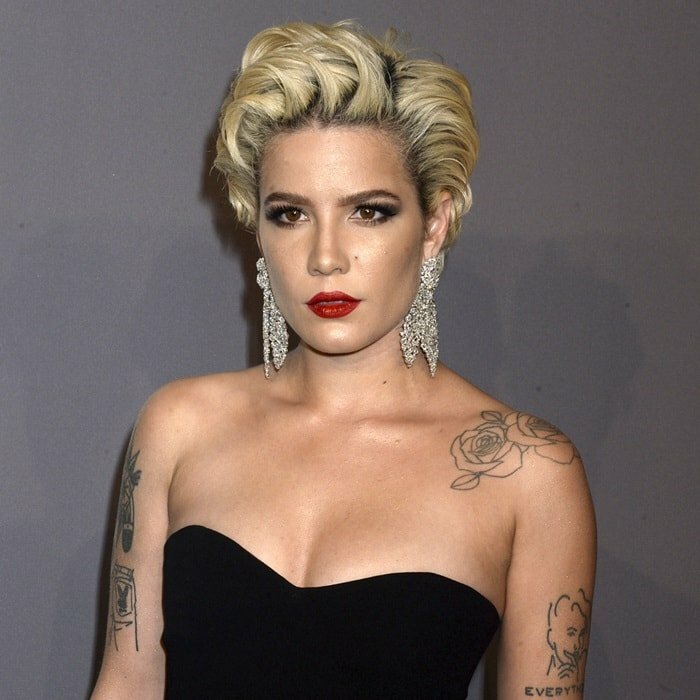 Halsey accessorized with 18 karat white gold and white diamond bow tie earrings from Lorraine Schwartz and a white diamond dragon fly ring. Perhaps she should consider getting a new stylist from Trunk Club or Stitch Fix? The 44-year-old German-American model, television personality, businesswoman, fashion designer, singer, television producer, author, and actress stepped out in a black asymmetrical strapless gown from the Zuhair Murad Spring 2017 Couture Collection featuring a high slit showered with electric blue crystals. Heidi Klum rounded off her outfit with Lorraine Schwartz sapphire earrings and Neil J Rodgers ‘Stella’ sandals. We’ve previously spotted the same style on Mila Kunis. The 25-year-old American actress, model, television presenter, cellist and beauty queen sparkled in a silver metallic off-shoulder dress from the Redemption Fall 2017 Couture Collection that looked a little dated. Olivia Culpo finished off her look with a David Yurman ‘Supernova’ ring and Gianvito Rossi ‘Portofino’ ankle-strap sandals that you can buy at Barneys New York.